China’s One Belt, One Road (OBOR) initiative aims to link sixty-five countries via locomotive and maritime exportation in order to boost economic and trade development. This initiative was created in 2013 by President Xi Jinping as a way to export excess supplies of cement and steel from China. The OBOR initiative also gives the necessary resources a developing country needs to build not only more infrastructure but also safer infrastructure. 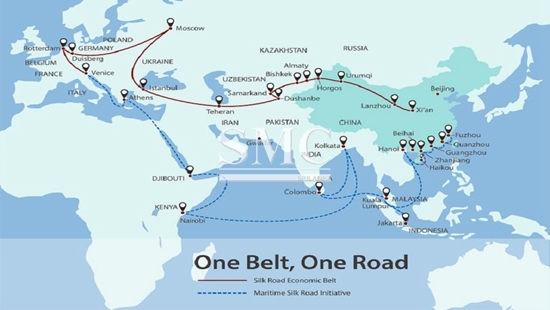 The estimated cost of the OBOR is roughly $1.7 trillion dollars yearly until the year 2030. This effort would stimulate the global economy abundantly, particularly the steel and cement industries. In 2002, China’s industrial industries experienced an economic boom that tripled their production in a mere five year span. Since 2009, however, China’s steel, cement, and aluminum industries have been over capacity. This has resulted in an abundance of profit loss in the last several years. However, the OBOR initiative would boost Chinas already lucrative steel industry by about twenty-two million tons per year until the year 2030. The Asian Development Bank estimates that in the Asia-Pacific area alone there is an $800 billion US dollar shortfall in infrastructure yearly. OBOR intends to fill that gap in infrastructure by using China’s abundance of infustructure materials. These boosts in steel and cement usage would benefit China’s steel and cement industries by helping them run closer capacity. This steel would be used for things such as roads, ports, and locomotives linking around sixty percent of the world’s population. This would allow China’s domestic use of these products to increase at more natural pace. For every one-billion dollars in infustructure investment an estimated 30,000 to 80,000 jobs would be created. These jobs would benefit the world’s economy and the people living in these areas. OBOR would improve the quality of life of citizens in less developed countries by creating jobs, affordable housing, and sustaining long term growth of the countries. The OBOR has the potential to greatly affect the global economy. OBOR aims to reach over forty percent of the global GDP. Specifically the steel, cement, and aluminum industries would see an abundance of growth. This growth will affect more than just the industries, governments, and economies involved; it will make a difference in the lives of millions of people by improving their qualities of life.